While the Shakespearean reference, from As You Like It, compares the world to the seven ages of man, it can also be applied to the way in which the Rothschild formula for gaining control of a nation’s money supply ultimately leads to that nation’s total subjugation to the elites. It is the elite rent seeking who control the world, and that will not change in the lifetime of anyone reading this, perhaps even for several successive generations to follow. “Rent seeking” is defined as those who spend wealth on influencing a nation’s government in order to increase one’s wealth without creating new wealth. Think of it more as a transfer of resources from any faction in favor of gaining control of those resources to those who have the power to influence. It is an inherently unfair redistribution mostly accomplished by manipulating disadvantageous competition, abetted by those who are in a position to bring about such change. Rent seeking through lobbying efforts is an easy example. The fascist corporate model in the US today, like Monsanto and its mandated use of GMOs is another, almost always at the expense of everyone else. Think of the Rothschild system of moneychangers gaining control over a nation’s money supply and its government as the highest rent seeking template. China and Russia are about ready to enter that web. Last week, we posited that both countries are likely to be the next world leaders over which the Rothschild system will eventually prevail, [ see Is The Golden Rule Broken? starting around the 11th paragraph.] What prompted that tangent thought was when Putin stated a few months back that he thought it important that the IMF be respected. Just a few weeks ago, Putin met with Christine Legarde, managing director of the IMF, while the two were in Bejing. Shortly after, while in Brisbane for the G20 Summit, Chinese president Xi Backs Higher IMF Standards. While surprising that the two seemingly anti-NWO stalwarts would be cozying up to the “enemy” is actually not so surprising. Neither China nor Russia are in a position to have their currency replace the FRN “dollar”as a world reserve currency. The entire global financial system has been staunchly in place for almost a century. Both China and Russia participate in it through their respective central banks, so it only makes sense that these two “outsiders” are eager to become primary insiders on a global scale. Knowing the Renminbi or Ruble cannot replace the fast-fading, self-destructing FRN“dollar,” what will? The Special Drawing Right [SDR], a basket of existing currencies is waiting in the wings to become the next global “currency,” and when it does, it is game, set, match for the NWO. Kiss any national sovereignty good-bye. Pledge allegiance to the United Nations, Agenda 21, IMF, et al. Kiss individual freedom good-bye, not that there is any, thanks to the NSA, GCHQ, NWO collection arm IRS, etc, with most citizens around the world already living in a militarized police state, including the United States. Zhou Xiaochuan of the People’s Bank of China is one of the most vocal members of the international community calling for the implementation of this new SDR system. And a big part of the structure of this new system is the Basel 3 regulations as put forth by the Bank for International Settlements. So it’s no surprise to learn that Zhou Xiaochuan is in fact one of the board members of the Bank for International Settlements. This should put to rest any conspiracy theories about China overthrowing the current banking system. We already know Russia cannot. Back to SDRs. The current basket of currencies is the US FRN “dollar,” Pound Sterling, Yen and Euro, all fiats and none with even the slightest hint of intrinsic value. What will change is the inclusion of the Renminbi and Ruble, partially gold-backed, and the SDRs will have some kind of gold backing and likely some degree of other commodity backing, certainly oil, and maybe some other natural resources, we do not know. The last thing the world wants is the collapse of the petrodollar for it would collapse the entire banking system and throw the world economy into a tailspin. The United States is the only loose cannon, and while its MIC [Military Industrial Complex] may be fading, it can become a dangerous world-renegade-gone-amok if the US cannot be contained in its current demise, fast becoming a Third World nation, empty of all ability to sustain itself economically, having squandered away all its industrial resources to outsourcing. For those expecting a new currency reset to be backed by gold and silver, it ain’t gonna happen. When the Rothschilds took over control of the United States via the Federal Reserve Act of 1913, FRNs were then also backed by gold and silver, circulating with gold and silver-backed United States Notes. That was by design to get Americans accustomed to Federal Reserve Notes as the nation’s currency. Also by design was the gradual recall and destruction of all US specie-backed Notes, and then the eventual withdrawal of gold and silver backing from Federal Reserve Notes, then and now backed only by the Full Faith And Credit Of The United States, aka fiat. This is a classical example of a decades orchestrated bait-and-switch by the Rothschilds, sothat the public would accept Federal Reserve Notes without having noticed the switch. Enter the Chinese Renminbi and Russian Ruble. Rinse and repeat. In some way or similar fashion, over a period of the next 50 to 100 years, the Renminbi and Ruble will suffer the same fate as the American Dollar, once considered “as good as gold.” This, in brief, is how the elites work. How will this impact gold and silver? The most immediate clue may come from the Swiss Gold Referendum concluding this weekend. If it passes, it would send a message to the rest of the world that the elites do not want, the encouragement of other nations to follow. If the moneychangers are still in total control, the referendum should fail. That is just our opinion, for we have no clue what the outcome will be. One thing is certain for all: no one has a clue as to how all this is going to unfold. There are clues, to be sure, as some have been given here, but the outcome, while not random, remains unknown. Will there be $5,000 or $10,000 gold, $200 or $500 silver? If the transition is to be via Special Drawing Rights, it may not be necessary to have such a dramatic increase for either metal. Keep in mind, regardless of whatever concessions the elites make toward including a partial backing of gold and silver as a part of the new SDR basket of currencies, they do not want either gold or silver to be viewed as a money substitute that will challenge their fiat-driven system. This argues for a tempering for a future PM rally. China and Russia, or maybe only China with Russia relegated to a lesser important role than might be expected, are but players on the elite’s stage, and make no mistake, the moneychangers remain in full control if SDRs are to become the new world currency. The rest of us remain bit players of no consequence on that stage, other than to serve and toil for the elite rent seeking directors behind the scenes. Another look at the charts, as 2014 draws nearer to an end and putting to an end all of the pronouncements from so-called experts that PMs would be much higher. We state, once again, do not listen to what others have to say about the market, but instead, watch what the charts [markets] are saying about others. 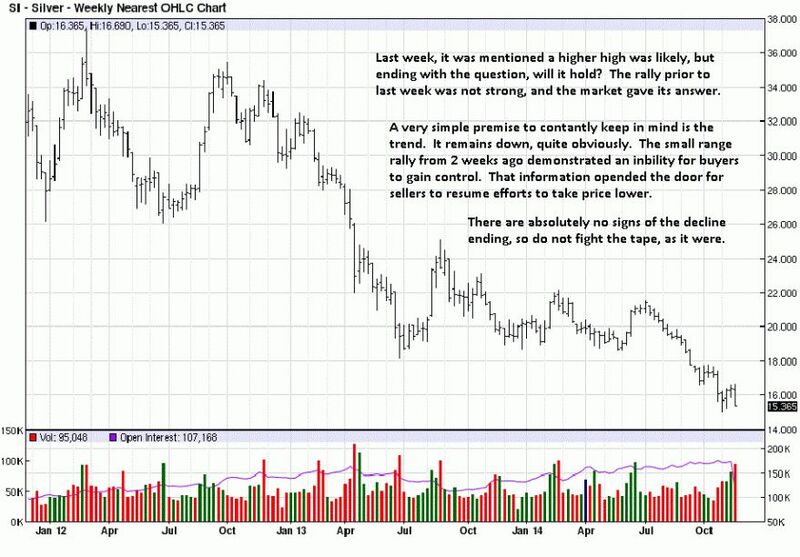 The charts do not lie, and opinions, regardless of source, always change to suit the current activity. After making comments on the charts, the theme appears to be how developing market activity provides the best guide for market direction. One qualifier, because there are many who express disdain for charts, and we have no quarrel with inability or ignorance, charts are not like a crystal ball that lets one see into the future. Instead, developing market activity, shown as the structure of a bar in its high, low, and close, coupled with volume form patterns, and these patterns often repeat over and over in any market. It will not be the exact same but often sufficient enough to rhyme. There is no foreseeable change for gold and silver that has not already been covered in previous articles and certainly elsewhere, so we are going to be more chart-oriented, this week. When you see a particular pattern unfolding, it signals how the market may unfold in the immediate future, from a probability stand point, and that is what trading markets is all about: higher probability degrees of how a market will unfold. While there is no specific pattern developing in the charts for this article to address, we do point out how specific activity points to the likelihood of how price will eventually respond in the near term. 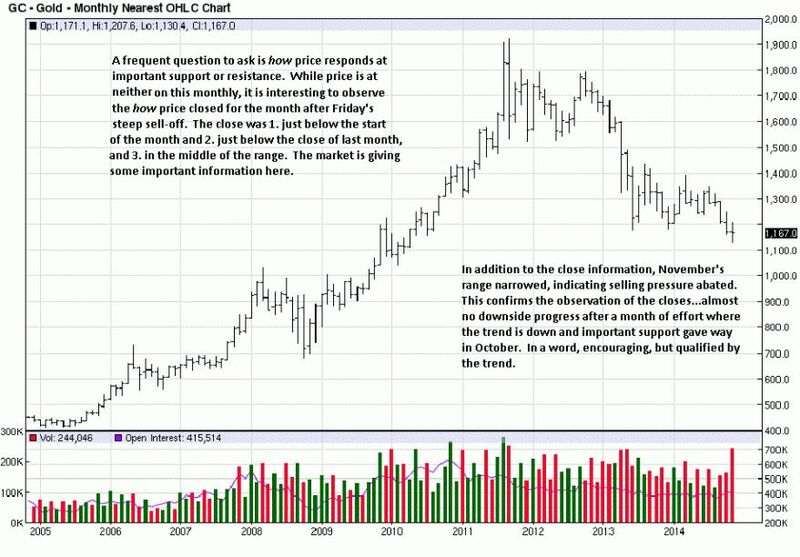 Another important factor before commenting on this week’s charts, when you are able to identify chart patterns and know how they develop through empirical observation, if you create a set of rules that define how you will trade a specific pattern, you are taking control over when and how you will participate in a market and not leaving your decision- making to chance or whim. When you start trading on higher probability outcomes only, your odds for successful results increases dramatically, and your risk exposure decreases. 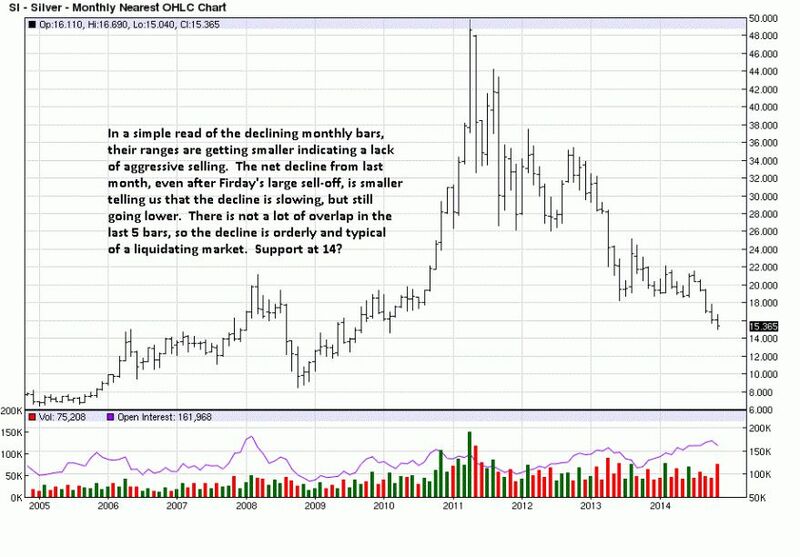 Comments on the monthly chart demonstrate how the market advertises its intent. Very often, you will not know what a market will do until after the fact, even when trading a specific high probability pattern that offers increased odds for a favorable outcome. This is why it is important to have activity confirm your observations prior to making a decision. We cannot know how December will unfold, nor should we care, but we can extract a few observations that suggests a slowing of the downward pace. The chart observation may not always lead to a trade, and certainly not from a monthly time frame, but there is a context for what may develop that can eventually lead to a trade on a lower time frame. Whenever a trend is down, the odds of a successful trade from the long side are much smaller, and the expectations for a favorable move have to be tempered and profits taken more quickly. Both the monthly and weekly are showing an ability for price to hold support. The daily is from where potential trades develop. The wide range bar lower is an immediate message to stay away from the long side until more favorable activity develops. 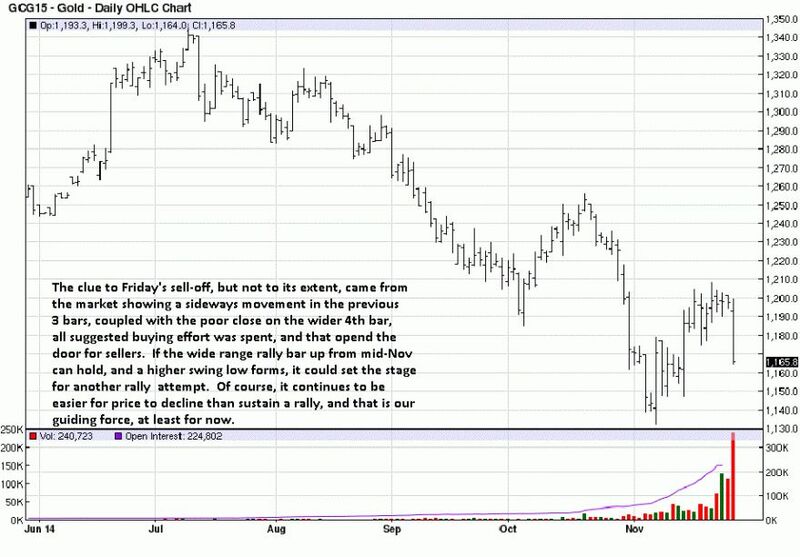 It has been our choice not to short gold or silver as a stance against the manipulators who are driving price lower. Were this a different market, there were clear signs of weakness leading up to Friday’s sell-off, and we note them on the chart comments. Since the strong rally higher in mid-November, price bars began overlapping, indicating a balance between buyers and sellers. When you know that from balance that unbalance will follow, and knowing the trend is down, odds are favorable for a short position based upon established rules of engagement. For example, note the poor close [mid-range], 5th bar from the right. The location of the close tells you sellers were present, otherwise the close would have been higher. Then, look to the left and note the activity at the end of October. Price moved down with ease, and that area is likely to become resistance. The poor close on the 5th bar confirms how price is struggling and likely to sell-off. The next 3 TDs move sideways, the closes are not strong, and the second bar from the end closes dead center of the previous 3 days, a form of balance about to become unhinged. The trend being down, price at defined resistance noted from the end of October, poor closes for the current week, any sign of a sell-off should trigger a short entry. This is one way to use developing market activity without having to guess or predict what may happen. Odds for a move lower were clearly favorable. 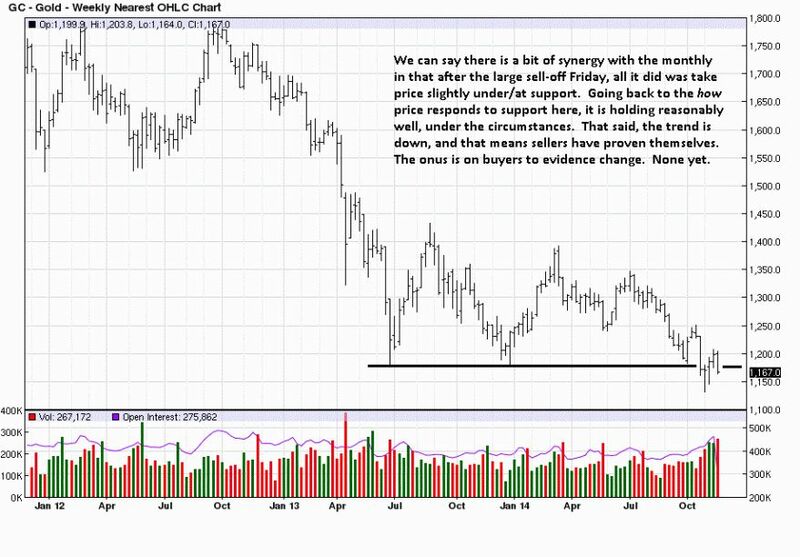 Keeping observations as simple as possible, until there are signs of a turnaround in price activity, silver will continue to sell off, or move sideways, based on the monthly chart. Volume is picking up and price is moving sideways within a clear down trend. There is nothing to suggest a change in direction, but the activity as just described warrants a caution flag for a lower move, even though odds favor more of the same. Again, charts are not a crystal ball, but they do send messages, and we see a potential sign of caution for a move lower, even though there is nothing yet to confirm it. 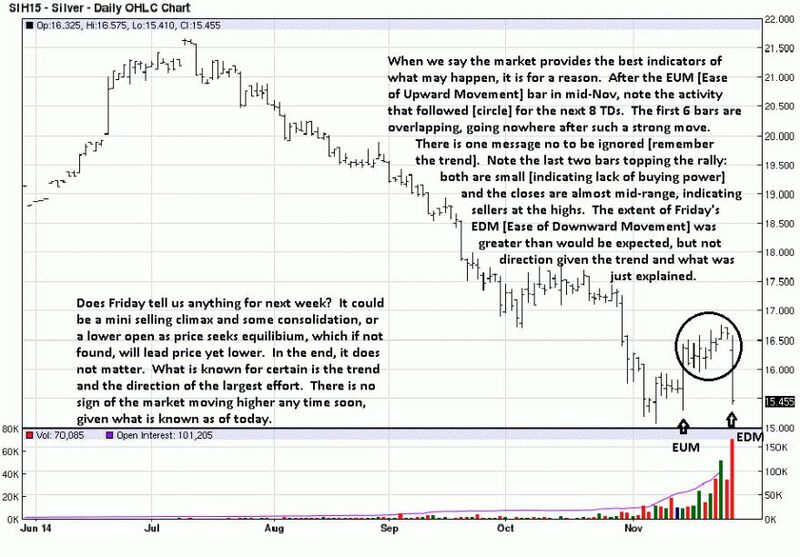 The comments for caution from the weekly may be for naught, but that is not the point. The point is to be aware of how activity appears, and then look for signs to confirm or deny, and this is how one sharpens one’s ability to read market activity. The daily does nothing to support the note of caution from above. It may change in the next few trading days, but that is not important. What matters is there is nothing from which to base a trade decision, and therefore no reason to waste time trying to imagine one.